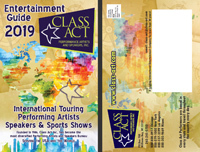 Class Act offers touring performing arts, international, college and corporate entertainment, family entertainment and school assemblies. Class Act is in its 29th year of bringing the best in the field of arts and entertainment to children and families everywhere. It is our goal to introduce the arts and entertainment into the lives of children who otherwise may not have the opportunity to experience the intrinsic rewards which the arts have to offer. Broadening children’s perspective and exposing them to a larger world through a diverse array of arts enhances a child’s development, which, in the long run, benefits all of society (or us). As a former cultural arts coordinator for my childrens school, I have seen firsthand the benefits and positive impact that exposure to the arts can have on the lives of young people. We are extremely proud of the group of gifted performers whom we represent. 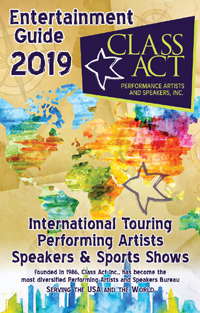 Each professional performer has been selected for talent, dedication, dependability and ability to relate to young audiences in an educational setting. We are grateful to our long list of loyal clients with whom we have had the opportunity to work. To you and to those who we are new to, we give our promise of superior professional performances and personal, dedicated attention to your needs. We continue to expand and update talent to assure the highest quality performances and a balanced roster. Call for the latest listing and availabilities. Please feel free to contact us with any questions that you might have, we're here to assist! If you're interested in receiving copies of our latest catalogs, be sure to fill out our catalog request form - or give us a call at 800-808-0917. Amazing Dog Performances - Disc, dock, agility, tricks and more! 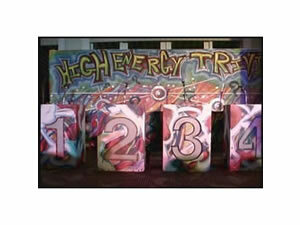 The Worlds's Largest & Original "Stunt Dog Show"
Magician, Juggler, Stilt Walker & More! Unicyclist, Balloon Artist, Stilt-Walker, and a little Magic. Empowering educators to better manage schools, classrooms and students by encouraging emotional development, self-love, compassion and kindness. Stilt Walkers, Living Statues, Bubble Shows, More! Speakers and Lecturers to Motivate, Educate and Inspire!